The Criterion Collection basically invented the commentary track, but as Criterion President Peter Becker — who makes a rare audio appearance on the “Moonrise Kingdom” commentary track — tells a distracted Wes Anderson, “[this commentary] is not about [Criterion].” It’s an amusing, comedically dry, occasionally patience-testing commentary track for Anderson’s eighth film. The “host” and self-proclaimed master of ceremonies on the commentary is, strangely enough, the young Jake Ryan who plays Lionel, one of the young siblings in the Bishop family, and he is joined by Anderson and the aforementioned Becker, hilariously trying to keep the scattered conversations on track. It’s one of the most curiously ramshackle Criterion commentaries in quite some time — the trio are joined by Edward Norton, Bill Murray, and co-writer Roman Coppola by speaker phone, with missed calls included and all — but really just as entertaining and informative, if perhaps slightly more discursive than you’re used to (they even have to edit out Norton’s home phone number at one point). With “Moonrise Kingdom” out on DVD/Blu-ray and having taken a breather from ranking Wes Anderson’s most “memorable” characters, now felt like a good time to dive into this fun, odd-duck commentary track. Here’s a few highlights. 1. There are subtle special effects everywhere throughout the film. “So the only thing that looks like a special effect, isn’t,” Peter Becker quipped. “Exactly,” Anderson laughed. “The thing I love about working with digital effects is compositing things,” the director continued. “It’s the ability we now have to take something and replace it or reposition or change text or modify things in the frame that are absolutely indistinguishable from if we had filmed it that way. All the time we rewrite text and it disappears, but that’s a different type of effects work. Oftentimes its the signage [that changes]. I would say, probably 80% of the shots have some kind of visual effect [or augmentation] and that all happened in post-production.” Miniatures were also used on the film mostly for the thunderstorm-precipitated flooding sequences. 2. Jake Ryan has worked with Anderson three times now. While Ryan only has a small role in the film, one of the younger brothers of Suzy Bishop (co-star Kara Hayward), he’s apparently worked with Anderson twice since, and four times if you include this commentary and the made-for-the-DVD short “Cousin Ben” starring Jason Schwartzman as the titular character. According to Anderson, the boy had a part in the “Fantastic Mr. Fox” Criterion release (though doesn’t elaborate on what that is) and Ryan also starred as the voice in a 2012 Sony Xperia stop motion animation commercial which Anderson said, “[he] made up all the dialogue for.” It was made by Anderson and the animation experts at House Special, a former division of Laika, which is an interesting collaboration. Perhaps Anderson will use him yet again. Also, the commentary is so lax and casual, Anderson asks Ryan to play a little Mozart — on a piano they conveniently have standing by — and he obliges. Anderson noted that the same thing happened to him with a child actor at the beginning of his career. “I remember on ‘Rushmore,’ Jason [Schwartzman] wasn’t really what we had in mind. Owen [Wilson] and I had this description of [the character] as a young Mick Jagger, but Jason’s like a young Dustin Hoffman.” Obviously it worked out for the best in both instances. This segment also has the great tangential conversation, “Did you have lunch yet Roman?” the answer “I have not,” the reply, “Are you hungry?” “I am.” And finally, “so are we.” They call Roman back by phone later in the commentary. 4. Wes Anderson likes to keep his crews as small as possible. Norton concurs with Anderson’s assessment of loving to pare down crew members and shares an amusing story. “[Francis McDormand noticed and said,] ‘we’re taking on water, we’re taking on water, does that matter? !’” recalled Norton with a laugh. “If you watch Wes in that moment [Norton shot little iPhone clips that are on the DVD], he’s not only not unconcerned about the safety of the children on the boat or anything like that. He immediately uses it as an opportunity to throw more crew off [the boat]. You can even see when the lightbulb goes off [and he thinks], ‘I know have a rationale for getting rid of more people’ and he immediately says, ‘Who can we lose?’ ” Anderson’s mischievously giggling under his breath on the commentary maybe makes the whole anecdote. During a subsequent phone conversation, Anderson says Murray mostly talked about the Herman Blume character in relation to Akira Kurosawa’s “Red Beard.” Neither Anderson nor Murray really remember what that was about and it’s too convoluted to explain here — “I can’t think this second what the heck I was thinking about in relation to ‘Red Beard,’” the actor admits — but it’s a nice namecheck and perhaps another reason you should buy the disc yourself. 6. Ed Norton doesn’t like line readings, but he likes their specificity when coming from Wes Anderson. “I find, whether its Wes or someone like Fincher, people who have very specific visions, I find it very comforting because you move into a different gear where you are fulfilling an incarnation of a very specific character idea. There’s a lot less uncertainty and you’re able to use the instrument of your ability to manifest the character into the service of something very specific. And that specificity is great — it’s like having a lot of your work done for you and I find that ironically very relaxing,” he said. – All the night footage in the film was shot day for night — a cinematic term denoting when night scenes are shot during the day, but made to look like nighttime. – Frank Borzage‘s black-and-white 1948 film noir “Moonrise” was a vague influence on the title, or at least it’s a word that Anderson likes, but the films are not at all similar. – There is one DVD extra devoted to the fictitious young adult books Anderson invented for the movie that Suzie Bishop’s character brings in her suitcase. They are “Shelby And The Universe” about gymnasts, “The Francine Odysseys” about a girl and a troubled lion, the futuristic “The Girl From Jupiter,” “Disappearance Of The 6th Grade,” the runaway story “The Light Of Seven Matchsticks” and professional witch hunter tale, “The Return Of Auntie Lorraine.” All of the book covers are drawn by Eric Anderson, though the animated segments are all completed by different artists. Actress Kara Hayward reads one brief passage from each book set to an animated segment that brings the book to life. It’s quite nifty and you can watch it below. 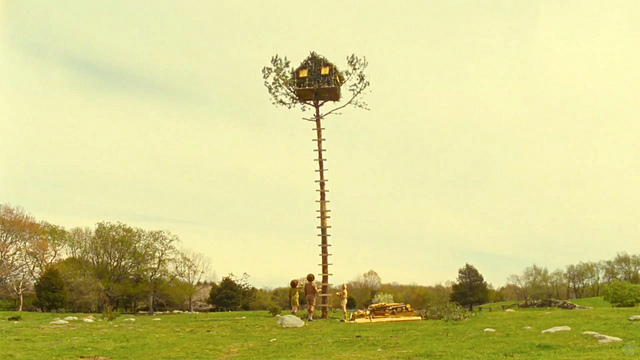 “Moonrise Kingdom” is available now on DVD/Blu-ray.